HPE is sponsoring a complimentary digital download of my latest book – iSpeak Cloud: Embracing Digital Transformation. The latest one is a culmination of nearly 60 update interviews added to the 5 Phase process highlighted in volume 1 of iSpeak Cloud: Crossing the Cloud Chasm. It features new chasm causes, collective prescriptive guidance from top performers and industry luminaries such as Malcolm Fry – father of ITIL, Andy Mann from Splunk, Marios Daminades from ISSACA and Winston Bumpus from DMTF. If you are looking for more of the how to formulate a Digital Transformation strategy – then this is a great reference piece. HPE Business Insights – “How Top Performers Approach Digital Transformation” and “Why Digital Natives Should Have a Seat at the Transformation Table“. Download your Complimentary Copy for Kindle Today! The iSpeak™ Webcast series went off with a bang last month with 148 viewers chiming in and more to come in the after hours recorded session. We want to thank both the guest speakers – Michael Mattal from Avnet and Chris Armstrong from TeKnow Consulting for the great job they did covering the Hidden Cost of Cloud. If you want to review the presentation click here. DevOps like any new initiative has come to pass through much trial an error. This month we are proud to host Andi Mann (Business Technology Strategist from Sageable and former VP of Cloud Strategy at CA) and Brian Elkins -( VP of Engineering and DevOps Practioner) as we explore the Top 5 DevOps Implementation Mistakes and provide presecriptive guidance on how to avoid them. The webinar will be on August 18th at 9AM PST. On July 21st at 9AM we will be kicking off the first of a monthly series about industry trends and topics around IT on #BrightTalk. The first topic in the series will be on Hidden Costs and Challenges of Cloud Computing that both the Business Leaders and Technologists need to take into consideration when building out Services on Cloud Infrastructures (Private, Public, or Hybrid). Join Michael Mattal – leader in Avnet Amazon AWS Practice and Chris Armstrong – founder of TeKnow Consulting as they provide insights and best practices along with me around building a solid business case. During the session we will explore key factors that contribute to the Hidden Costs and Challengs along with prescriptive guidance to address them. Why attend? Many of the companies I have worked with over the years end up with projects that overstate benefits and underestimate the costs – leaving IT to figure out how to keep the business running post project launch. As Cloud Computing has become mainstream – it is no exception to this rule. Implementing services on a Cloud environment has been painted as if it is the easy button and will solve world hunger. Seasoned IT professionals know that regardless of who is hosting the hardware – best practices around services are still required to be successful. In the zealous rush to the Cloud many times these best practices have been overlooked leading to both Cloud Sprawl but also hidden costs and risks to the company. Last weeks International Association of IT Asset Managers (IAITAM) was a reminder that although many of the tools have come a long way – there is still a long way to go. During my 2 sessions on iSpeak Cloud: Crossing the Cloud Chasm – it became very apparent that many Asset Managers are struggling to keep their head above water even prior to making the preverbal leap to understand the complexities of tracking assets across Hybrid Cloud environments. Although some of the licensing structures such as Microsoft Office 365 ™ have nailed the requirements for licensing across the on premise/off premise world – the question still remains in how Asset and License Managers track and continue to enforce compliance. Just because you can put workloads in the cloud doesn’t always mean that you should. License compliance is often an afterthought in the race to the cloud to get solutions that are faster, cheaper, and considered better by not only IT but also the business. The uncontrolled growth of shadow IT combined with the limited ability to calculate true usage across hybrid environments – often leaves a significant gap and risk from license compliance. How can companies curb the cost and risk of License Compliance in the Cloud? Adopt SWID (Software ID Tags) and insist that your ISVs do the same. Software ID Tags are finally gaining traction and hold the promise of reducing some of the ambiguity issues that have plagued IT for nearly two decades. Learn more about them at Tagvault.org. Insure Asset Managers have a “seat at the table” in the Cloud strategy conversation. More often than not Asset Managers are informed of the strategy but not part of the discussion. This is a fatal mistake as more often than not the Asset Management team will know the critical license terms that can make or break your cloud strategy. Insist on visibility reports from ISVs until tagging is available. Ideally software solutions providers should provide a monthly usage report that aggregates login across users. It is important that license usage is tracked and aggregated acres Business Units. Obtain reports from tools like the AWS Calculator from Avnet to to understand where the virtual environments are and who to call to find out additional details on licensing processes and procedures followed. Create a culture of accountability and responsible Cloud usage. Many cloud solutions can provide chargeback/showback. Metering is one of the primary business cases for cloud – so not charging back or providing an overview of the implementation related issues can derail solution sets. It is important that companies drive a culture of accountability when signing up for or bursting resources into the cloud. Instituting a Use IT or Lose IT policy with an ongoing maintenance and audit process will help companies maintain compliance. 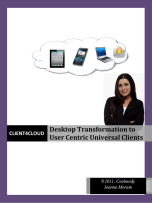 In 2007 while I was at Thinstall/VMware, I predicted and crafted the vision for Universal Clients – applications and data that follows the user regardless of network, device or connectivity. Although 30 out of 40 customers I had interviewed indicated they desired this ability even then – those of us in the industry knew it would take years for not only the underlying infrastructure technology to evolve but the people and processes overseeing them. Why? Because the current implementations of ITIL and Business Service Management were created prior to and in parallel with the adoption of Cloud solutions and still need to be revised to embrace changes in the market and these new technology advances. The Forbes article with Gartner’s predictions for 2015 is an interesting article on how the cloud will evolve into a hybrid model well into 2015. How the Top 5 Cloud Trends will Impact the Enterprise in 2015 – Forbes. What is interesting about the Forbes article is that even the top analyst at Gartner still lose sight of the fact that ALL companies have had some form of hybrid cloud solution in place for several years. What the Nexus of Forces overlooks are the root causes driving what I had coined the “Clash in the Cloud” and fueling the growing appetite for Universal Clients. Based on my research for iSpeak Cloud – Companies need to focus on creating a Cohesive Cloud Strategy and addressing the underlying causes that are creating Cloud Sprawl and Stall to be successful in their cloud initiatives. Many of the companies I interviewed stated they had any where from 160-300 cloud based applications that IT was unaware of come up in their cloud audits. This reflects an epidemic that needs to be addressed to reduce the risks of increases costs and being out of compliance with key business, security and regulatory directives. 1) Address growing Digital Native workforce. Putting up guardrails and policies to control but not hinder the growing population of Digital Natives whose use of technology was developed in their formative years when they learned basic communication and life skills – birth to five. These individuals are more prone to subconsciously gravitate toward alternative solutions to gain work life balance and simply get their jobs done without thinking about policies in place. 2) Refactoring business cases for Cloud. The Cloud changes the dynamics of your business case. Many IT and Business Executives alike are caught off guard when they find that their Business Case for Cloud may be more expensive then the solution they were replacing due to loss in depreciation benefits. Companies need to change their modeling to reflect the lifespan of the service and include other hidden costs to insure what they are selecting – private, public or hybrid meets the cost objectives. Otherwise more often then not IT is stretched too thin due to increase cuts due to business cases that understate costs and overstate value. 3) Creation of Cloud Governance Committee. Early attempts at a Cohesive Cloud Strategy have typically failed because they were driven solely by IT or by a subset of players for political reasons. In order for companies to be successful they need to have a Cloud Governance Committee that consists of Business, Legal, Finance, IT, and Security at a minimum. Word of Caution: Do not give away your cloud strategy or policies to a Cloud Service Broker as these areas are mission critical to the business and need to be governed by those that understand it best. 4) Make it a goal to address Shadow IT across Business and IT. The Cloud Governance Committee should address and provide guardrails to slow down and/or significantly reduce Shadow IT. Business Leaders would need to commit to quit hiring technical resources so they can circumvent IT only to find out later that the business case excluded key costs or requirements such as disaster recovery or business continuity. 5) Create and enforce policies and precedence for compliance of your Hybrid Cloud Environment. Regardless of what analyst is saying the inconvenient truth is that companies already have Hybrid Cloud Solutions. Because many of those solutions were adopted under the radar this leaves the Company at great risk of exposure to not being in compliance with key License, Business, and Regulatory requirements. Company’s need to audit to see what they have, assess the risk to the business and put policies and procedures in place for addressing both current and future risks. Contractors can help in the short term but unless the root causes are addressed this will only continue to be an issue for years to come. 6) Adjust People and Processes along with Cloud Technology beyond current ITIL and Business Service Management framework. As one of the thought leaders behind Business Service Management at Marimba/BMC – I can say that this area really needs to be revisited and revised to address the newer technologies, hybrid cloud implementations, lack of involvement of key stakeholders from the Business, usage of Big Data, and compliance changes. The Cohesive Cloud Strategy should include training and uplifting critical resources to address skills shortages, incorporate a compliance first architecture/policy, services driven by joint business cases (Business & IT), and an enhanced asset management framework across hybrid infrastructures. In our workshop on iSpeak Cloud we provide the framework that can assist company’s in creating their Cohesive Cloud Strategy to not only address Cloud Sprawl and Stall but the compliance risks to their business. We provide templates and guidance based on real world implementation experience and interviews from Fortune 2000 companies to address process enhancements needed to the current frameworks. For more information on the workshops please follow the link to register or contact me at jmorain71@gmail.com. Many believe that virtualization equals cloud. Although virtualization works as a catalyst in creating a more efficient, scalable and dynamic cloud environment, it does not “automagically” turn a company’s environment into a cloud. In fact, if you review the five key characteristics in my previous post, you’ll see that they may or may not require virtualization at all. For example, in the 1990s, I worked for a voicemail telecommunications provider that offered highly expandable system architectures that scaled and spanned across multiple users, networks, carriers and environments to provide telephony services for hundreds of thousands across the globe. All without virtualization. The solution would have been considered a cloud solution given the NIST definition. Why? Because voicemail systems have the five key characteristics of cloud. They are elastic, they provide self service on demand, they span a broad network, they leverage a pool of hardware and software resources and they have sophisticated capabilities for measuring and reporting usage. The point is that, although cloud wasn’t even defined until 2011, this model has existed across other industries for decades with and without earlier forms of virtualization. As senior IT leaders, whether or not you have deployed cloud, more than likely both you and your business users have used solutions that were enabled by a cloud backbone or infrastructure. Every day when you pick up your cell phone, text your colleague about that important meeting or send an email, you are leveraging a cloud-based infrastructure. For this very reason, the best cloud providers are actually the telecommunications providers — with a few exceptions such as Amazon and Saavis. Why is this revelation important? How often do you have to think about the technical requirements or solutions it takes to deliver your phone service? You don’t. You just expect it to work. And when it doesn’t, very rarely are you calling the provider to tell them how to solve the problem or asking about network or other technical details. You merely provide the symptoms that demonstrate the “service” isn’t working. Yet when we, as IT professionals, sell a solution to our business counterparts, we typically talk in terms of the underlying technology versus the “services” that we will be able to deliver. Cloud washing is an epidemic that not only impacts IT but also the business and in part is fueling Shadow IT. Why? Because vendors are using the same buzz words that business users are hearing from their IT counterparts. Virtualization. Cloud. Agility. Elasticity. These cloud washers are employing business language to describe how the service they provide will address the pain points as well as reduce costs and increase time to value. In many cases the vendors are now bypassing IT all together and selling directly to their business counterparts. This is particularly true for SaaS solutions and in part for Infrastructure as a Service (IaaS) offerings. However well intentioned, these vendors and your business counterparts are, the solutions they are deploying are often driving up risk and introducing hidden costs. iSpeak Cloud discusses the importance and strategies at insuring the Business has a seat at the table with IT. The format of the book was created to provide the different perspectives that many executives have to think about when devising an overall cloud strategy. The key is to have a strategy and strong relationship with your Business counterparts so in lieu of working around IT – you are the first they turn to as their trusted adviser. Although it may seem idealistic – from my experience in implementing these solutions it is very possible for both IT and the Business to embrace the change and work together toward joint solutions that help bridge the cloud chasm. Doing so will not only increase viability of the cloud services you offer but also help improve the overall company’s bottom line. Cloud washing is the practice of rebranding products to incorporate the term cloud whether or not the product was purpose built for the cloud. This practice makes cutting through the hype and clutter around cloud a nearly insurmountable task. Cleaning the cloud wash starts with understanding what a cloud is and what it isn’t. This knowledge enables senior IT leaders to make informed decisions on the overall IT strategy. Cloud washing is not a new phenomenon and, despite thoughts to the contrary, it’s often unintentional. After all, marketers are tasked with making and keeping their products relevant in the market. They may be experts in marketing and market campaigns, but few of them are technologists and few of them thoroughly understand the purpose of cloud and the benefits cloud has to offer. Cloud washing often stems from a failure to understand that hosting products in a SaaS environment when those products were built on a traditional client-server infrastructure does not make them cloud offerings. Likewise, running those products in a virtualized environment that is not elastic, shared, on demand or measureable does not result in a cloud offering. What many companies believe is a cloud environment is, in reality, an excellent virtualized and optimized data center. But it’s still one step short of being a cloud environment. There is nothing wrong with leveraging a highly virtualized environment, as long as it solves the business service needs outlined by customers. At the end of the day, no matter what environment is in place, the most important job of IT is delivering a highly functional business service designed to fit key directives (business, regulatory, security and so forth) to achieve business agility. Keep in mind that if your cloud does not save money, provide faster more agile service or benefit the company in some way, the technology it was built on is inconsequential in the grand scheme of things. Not everything needs to be in the cloud. Not everything should be in the cloud. Other environments will continue to play an important role in the IT strategy. What’s essential is that your business partners are educated on what they are getting and not in terms of the service they are looking for. When the term cloud is as prevalent in the market as Kleenex and Coke, how do you clean the cloud wash? You start by clearly defining what cloud is and what it isn’t. Next, you ensure that vendors can pass your cloud sniff test. That involves ensuring that the vendors understand what a cloud is or isn’t. 1) How does the solution provide elasticity or the ability to scale or contract on demand as the service requires it? 2) How does the solution enable you to pool resources across the stack to lift and shift workloads on demand to reduce hot spots and cold spots? 3) How does the service access the network and what is the depth and breadth of that network access to create a modular expanded system architecture (MESA) for continuous operations across hardware boundaries? 4) What capabilities — for example, portals and configurations — are available to enable self-service demand and manage that demand in an automated fashion? 5) What reports, analytics or capabilities are there to measure the service early and often from the standpoint of security, usage and overall success metrics ratios? If the solution provider can’t provide succinct and quick answers to these questions, then chances are the offering is not truly cloud based. It may instead be some mix of virtualization, hosted compute or even some cloud integrations. These questions, by the way, align with the National Institute of Standards and Technology (NIST) definition of cloud, which says that a cloud solution must, at a minimum, possess these five characteristics: elasticity, pooled resources, depth and breadth of network, self service and measurability (2011, NIST). Cloud visions can come crashing down when the reality costs of poorly understood implementations come to bear. Some customers I have worked with over the years have seen cost variances that fluctuate as much as a 100% from the original business case. Despite all the Cloud experts, technologies and consultants – even the best laid plans could be side tracked if costs rise out of control. This is in part due to the nascent nature of Cloud computing being full of hidden costs, surprises and the clash of changes that are currently impacting IT. In Client4Cloud we talk about some of the key planning concepts required to address the “Clash in the Cloud” that is creating disruption with IT Departments everywhere. Like an onion the Cloud has complex layers that as you peel them away could uncover additional interdependent costs. In iSpeak Cloud: Crossing the Cloud Chasm – we provide prescriptive guidance on how to build a cohesive business case that accounts for the many changes that Cloud Computing represents to IT beyond technology. People and process are some of the biggest factors impacting costs. Few realized that by moving to a cloud based platform with a 3rd party tool that the people resources and process improvements they are working on are not capital expenses because you do not own but rent public cloud and/or software as a service solutions. Move to a Product Portfolio View -plan your implementations based on solutions being offered and issues solved. Create best practices around a Service Catalog approach that has sufficient charge back or show back to insure funding is being allocated to the correct projects. Calculate costs based “depreciable life” of service – not just initial investment. many programs are calculated just on the initial investment but do not take into account the true total costs of ownership required to support the “products” over their lifespan with the company. Refactor resources based on area of expense. Many development teams will not only take depreciation on hardware but also time to create the software. If the product will be resold or used in the same manor it was previously but on a 3rd party cloud – it is important to refactor what the resource costs will be. Use Reverse Proxies with your Configuration Management Tools - The dirty little secret in the industry is you could monitor inventory of 3rd party systems with even previous tools. If the Configuration Management Tool supports a reverse proxy then you would want to host it in the 3rd party cloud environment to report back on what you are using in terms of licenses attached to your account. Understand Integration, Tuning and Timing – It is important to understand what resources are being used, which aren’t and why, along with integration points and overall minimal requirements for timing across intersecting projects. iSpeak Cloud: Crossing the Cloud Chasm is about the journey that many companies have to make to reign in the Hybrid Cloud Hydra and regain control over the Cloud Sprawl and Stall that many companies face today. For the last 2 years I have interviewed several people in different roles at companies that varied from Software as a Service Solution Providers to Enterprise IT Executives and Employees. There is an obvious gap between where many vendors/analyst say the status of the Cloud is and reality for many organizations. They speak of the Hybrid Cloud as if it is something to come in the next 2-5 years when in reality most organizations have some form of Hybrid Cloud implementation already in place. Many companies struggle with balancing agility, time to value, and security with their overall implementation of cloud based solutions. My new book provides a recipe for success in building out a cohesive cloud strategy to reign in Cloud Sprawl and Stall and harness the power and savings a cohesive cloud strategy can create. Each day of the 3 day workshop represents best practices that have been implemented and vetted for addressing key strategies and initiatives in today’s IT world from DevOps, Agile, and New Costing Models Cloud Computing. The later being critical because the cloud is the gift that keeps giving. For many enterprise business leaders and financial officers it is eye opening to see how this new paradigm shift significantly impacts not only cost savings but compliance to key business, regulatory, and security initiatives. iSpeak Cloud, Crossing the Cloud Chasm puts you the reader into the heart of discussions that many executives need to make across the company from IT, CFO, and the Business. For readers interested in any of the templates used or referenced – please send us an email request. As 2013 comes to a close and 2014 is upon us – we should reflect on what the actual current state of Cloud is. The “Cloud” has reached a very similar point to virtualization – they have hit a point of Cloud Sprawl and Cloud Stall. In fact many companies are now faced with taming the Hybrid Cloud Hydra. A Hybrid Cloud Hydra is similar to the mythical beasts that many try to defeat in World of WarCraft or online fantasy games. Unlike the games – it is in fact a reality for many in IT because the business, users, and even IT have run to the cloud without assessing true impact (Costs, Compliance, Consumption). As a result many in IT are discovering that their users are leveraging 3rd party applications that put the company at risk from both a budgetary and compliance (security, regulatory, business) perspective. Many I have interviewed have been impacted and surprised by the number of applications being leveraged in either a software as a service or infrastructure as as service in off premise environments. Although there is quite a bit of hype and traction around Cloud – in 2014 we will see a retraction. The pendulum has swung far in one direction to the dismay and disappointment of many from both the vendor and Enterprise IT community. Why? Because the Cloud has been hyped up as the easy button to solve all IT woes in people, process, and technologies. Unfortunately, there is no easy button and many of the benefits being espoused need to be re-evaluated. As part of the re-evaluation – 2014 will bring opportunity and renewed focus on IT. New Audit standards around cloud computing were published in May of 2012. Audit will finally catch up. They will have moved from discovery mode to enforcement mode with renewed focus on reducing risks for organizations. This in part will be due to the increased risks to data and high profile attacks such as the one that occurred to Target customers over the holidays. The increase in audits will drive change in behaviors both within the business and IT users. 2. Renewed Focus on Business & IT Partnership To this point both business and IT have not been partnering but working around each other. The relationship between the business and IT will be put to the test this year by the Chief Financial Officer. Many entities have reported that their business cases built either in absence of business or IT – were not realized to the point they had hoped. In addition – many Enterprise leaders are finding that it may be more prudent to move to a hybrid solution for not only economic but compliance to key security, regulatory and risk reduction. The business and IT leaders will come to a realization that they need each other. That the business is not technical enough to go it alone and IT needs to learn to speak the language of finance to insure critical projects see the light of day. 3. Cloud Services will ExpandCloud Services will expand to help companies create processes, policies and procedures to create a cohesive cloud strategy. Once the CFO paints the reality of the past efforts for cloud in terms of costs, compliance, and containment – both IT and Business will look to leaders in the space to help them create a cohesive Hybrid Cloud Strategy. The role of the Cloud Service Broker will become a more critical role. IT Leaders will have to become the Broker of Cloud Service Brokers. 2014 will be all about Enterprise IT driving vendors to provide open APIs and integrating. APIs will be the key to interoperability and taming hybrid environments. They will be a critical component similar to what Simple Network Management Protocol and Management Information Bases did for Telephony and Networking in the late 90′s and early 2000′s. 5. Move to In Sourcing and MSPsMany Enterprise IT Executives will be slightly disappointed when the true cost of cloud is calculated. There will be an insurgence in the the requirement of lifting and shifting work loads around from 3rd party providers to on premise. Many software as a service solutions will be asked to consider becoming managed service providers on corporate private clouds to address concerns raised by audit, business, and finance. Enterprises will be interested in what is the best way to determine routes to cloud value and leverage legacy solutions with new cloud solutions. The hybrid cloud hydra will not be tamed in 2014 but will start to become focus. Similar to other major paradigm shifts – the cloud, mobility, and social media will continue to create challenges for years to come. This year will just be the culmination of driving change in people, process and technology to address the challenges now that Cloud Sprawl has hit critical mass. Although other key trends such as the need for Licensing as a Service, Cloud Cost Containment Models, and Hybrid Cloud Management portals will be in high demand the people, process and technology will still be too nascent for those areas.